The Government of Honduras and the Port of Busan today signed a Memorandum of Understanding (MOU) that aims to establish strategic partnerships to develop trade and the shipping business between ports. The agreement provides for port development, management, and operation, building a logistics park, as well as the development of joint projects, and cooperation in other areas, as may be decided by mutual agreement of the parties. President Juan Orlando Hernández visited the South Korean southern port city of Busan, to hold talks with Busan Mayor, Seo Byung-soo, and discussed ways to expand cooperation between the city and Honduras in fields such as trade, education, culture and sports. 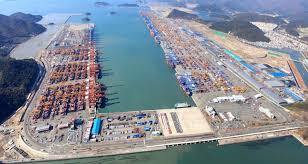 President Hernández congratulated the Busan port authorities for their vision and spirit of persistent work, and said that Honduras hopes to learn from South Korea’s economic development as well as establish a sisterhood relationship with the Busan City, expressing hope for active exchanges with the city in relation to Honduras’ port modernization project. The President explained that the country of Honduras has two ports on the Atlantic, and one on the Pacific, and that both oceans are united through a road of 391 kilometers. The goal is to consolidate the three land ports to provide one of the most important logistics services in the Americas. An option with extraordinary strategic value, explained Hernández. “Keep in mind that in the Americas, in Honduras, you have a friend who wants to help you, with its geographical position at the heart of America, where there are a tremendous amount of maritime routes,” said the President. Hernández also met with Cho Sung, CEO of the Chamber of Commerce and Industry of Busan, and other entrepreneurs to outline the advantages Honduras offers on investment. President Hernández received honorary citizenship from the city of Busan. * The Container Security Initiative (CSI) allows U.S. Customs and Border Protection, working with host government Customs Services, to examine high-risk maritime containerized cargo at foreign seaports, before they are loaded on board vessels destined for the United States. There are currently 58 foreign ports participating in CSI, accounting for 85 percent of container traffic bound for the United States. The Secure Freight Initiative (SFI) seeks additional port and container security, the initial phase of the Secure Freight Initiative deploys of a combination of existing technology and proven nuclear detection devices to participating foreign ports.